A lot of people believe that the more you have, the easier your life is and the happier you are. Believing it will lead them to the better life, many people want to get more and more. 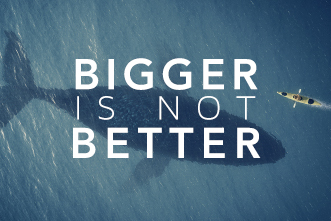 But if you really think about it, bigger is not always better. Sometimes it's the opposite. Sometimes, when you try too hard to get more, simple things change to be complicated. Sometimes, when you focus too much on getting better, you can't be thankful and enjoy what you already have. If that's the case, then what's the point in having more and getting bigger? One of the things I learn from life is, the quality of your life really can't be measured by the quantity of what you have. If that was true, rich people with a lot of money would be the happiest. But look around you. I still meet a lot of "poor" people because they have nothing but money. Surprisingly, I also meet people who don't really have much, but they look happy and really enjoy their days. They are the people who know to be grateful for the simple things in life. They are the smart people who know that happiness doesn't cost much. They know that happiness is about what we feel and not what we have. So, every time you feel like complaining for not having more, remember that you can be happy when you are grateful, and your life can be easy when you have the right attitude. It really has nothing to do with how much you have. Thank you for this post! Another good one!